We are frequently asked if treatment by MuniRem Reagent can achieve DoD level 5x decontamination. In a number of recent projects, equipment that had been decontaminated with MuniRem Reagent in solution was certified by a UXOSO/QSC to be Level 5x and the material was safe for routine transportation off-site for recycling or reuse. 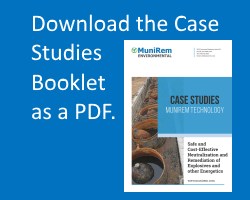 In a particular project that presented severely contaminated buildings and equipment, it was initially assumed by the customer and prime contractor that MuniRem could render the facilities safe for work but that subsequent thermal treatment would be required to achieve Level 5x for the equipment. In fact, Level 5x was achieved by the MuniRem treatment alone and the planned follow-on thermal treatment was not required. In our case studies booklet, studies 6, 7 and 10 are examples of the achievement of DoD level 5x decontamination.